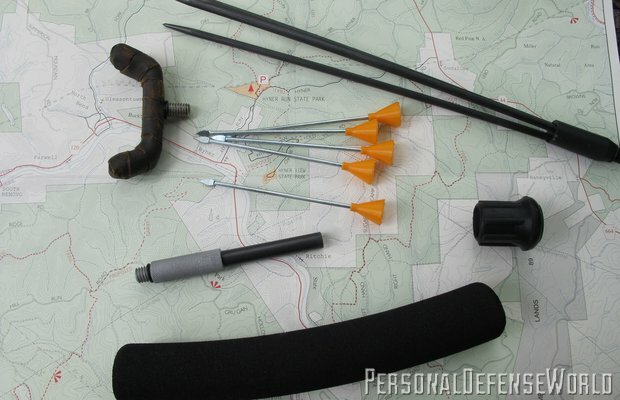 A wide variety of accessories are available with the Survival Staff. It comes standard with the blowgun darts and foam rubber grip and end cap, while the fire starter and rifle rest are optional. 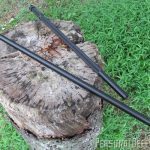 The Survival Staff is made up of two main components: a long hollow aluminum pipe and a shorter pipe that contains the hand ground 440C knife blade. 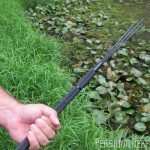 One of the available options for the Crawford Survival Staff is the three-prong fish point. Anyone who’s camped with me knows that I have an affinity for the hiking staff. A staff is useful for a myriad of things from being a simple support while walking, to checking for stable footing while crossing streams and loose rocks, and flinging snakes out of your path. It’s also an age old, simple but effective defensive tool that’s generally legal just about anywhere. When I had a chance to meet Pat and Wes Crawford at a knife show earlier this year, I knew they had taken this concept to the next level with their Survival Staff. Crawford Knives has been making the Survival Staff since 1985 and they’ve got the concept quite refined by this point. 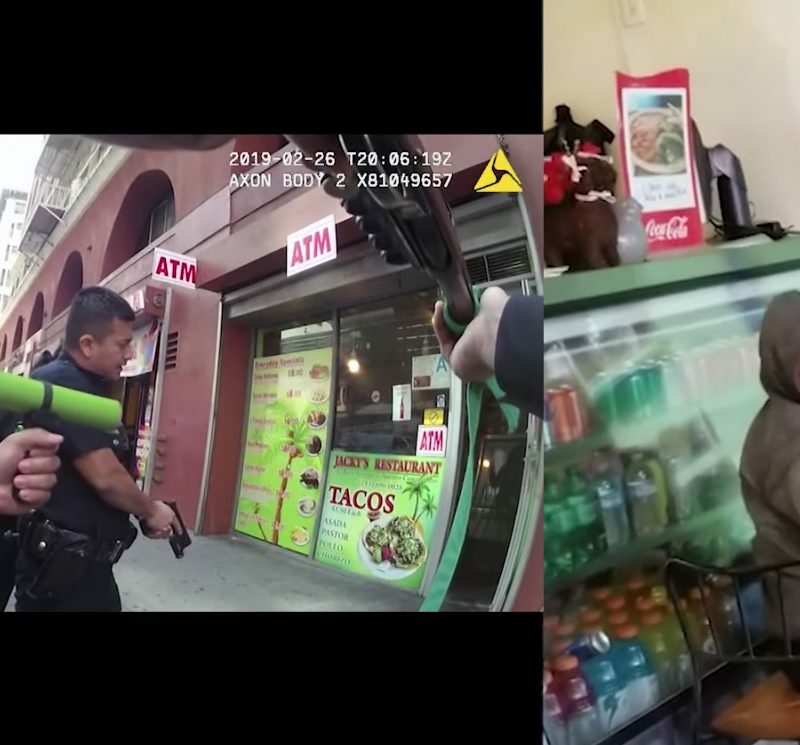 They take the basic staff concept and work an amazing amount of options into it so that even if all you have with you is your staff, you’ve got a lot of tools to handle unforeseen situations in the wild or even in the concrete jungles. Add in some optional accessories and you really have an amazing tool. Pat and Wes start with a 6061-T6 aluminum pipe as the base for the tool. Note that they say pipe, not tube and that’s important. This is a solid, sturdy, thick walled pipe, not a thin tube like I’ve seen in some knock offs of this concept. The basic package consists of a 33-inch long hollow tube body that doubles as a blowgun, a shorter 20-inch long tube body which can be used as a baton, a standard aluminum head and a mushroom cap top (a basic top piece with a lanyard hole), a bottom tip with a hardened steel point, a rubber end cap, a tube connector to connect the short and long tube, a soft foam rubber handle, six blowgun darts, and a custom, hand ground 11-inch 440C blade that screws into the handle. The blade is removable to allow for a variety of mounting choices or to remove it entirely for areas of the country where it may not be legal. The basic Survival Staff package goes for $294.95. 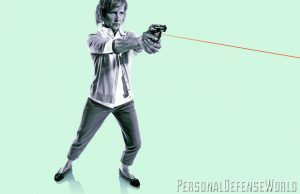 As if the basic staff isn’t enough, there are a variety of optional accessories available, too, that let you tailor your staff to your defensive and survival needs. 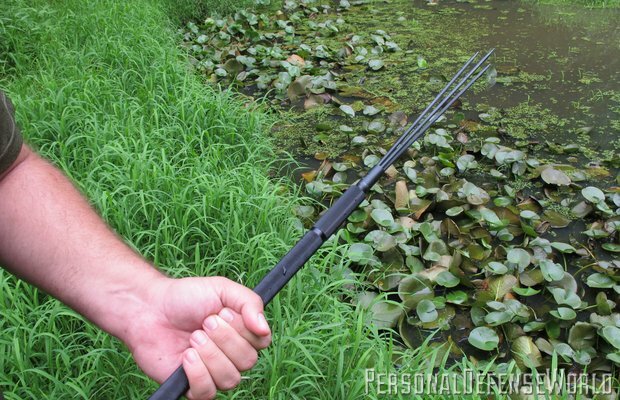 There is a three-prong fish point/frog gig, a rifle rest, a firesteel, a heavy steel head to add weight for use as a defensive baton, a T-handle for use with the longer tube to make a cane, survival tubes to allow you to store items in the hollow tube, spare O rings and blow gun darts and a camera adapter. There is also a basic and advanced survival kit option prepackaged in tubes to fit inside the staff as well. Last but not least is the Crawford Missile neck knife available as an option along with a mount that lets you mount it as a spear. In the field the Survival Staff works extremely well. The knurled aluminum provides for a solid grip while hiking and the foam rubber is a good option as well, especially in colder weather. I liked the traction that the steel tip gave on the trail but having the rubber tip as an option is nice for walking “Rails to Trails” paths or in an urban setting. The staff goes together and comes apart with ease, but still stays together when you’re using it. I had the chance to use it on a number of summer trips this year and showed it around to the folks I was camping with. 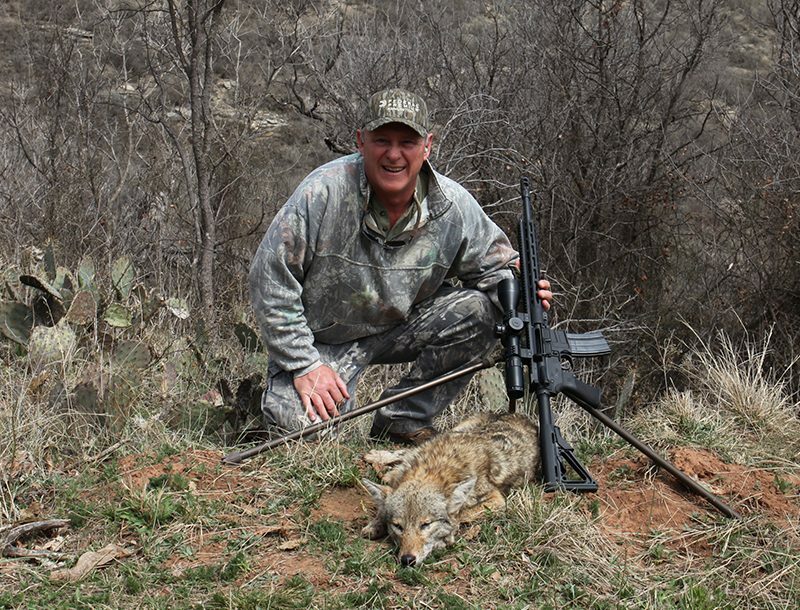 We tested out the blowgun and fish spear attachments, and used the rifle rest for some impromptu range sessions. All worked well and were welcome additions to my kit. For defensive use the staff itself is fairly formidable. It’s a sturdy, solid staff for blunt impact use and with the steel tip on the end acts as a mean thrusting tool as well. Upping the ante a bit, you can configure the knife to a lance configuration. I particularly liked the baton configuration. Using the shorter tube, you attach the mushroom cap on one end and the steel spike on the other. You end up with a knurled aluminum baton a bit over 25 inches in length. 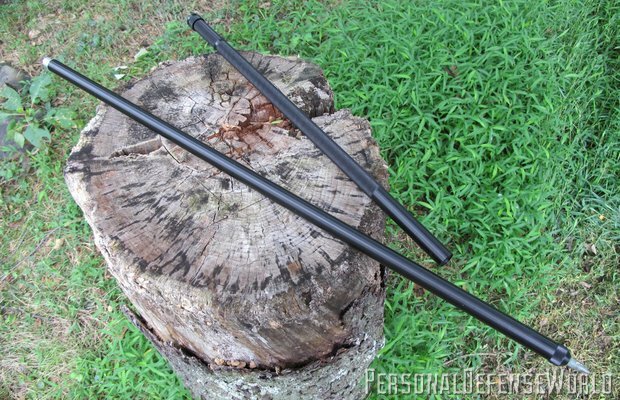 For anyone with any police or Eskrima training this is a comfortable and handy sized defense tool. 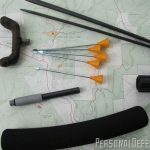 If you’re a fan of the hiking staff, and can appreciate the utility of multifunction items, the Crawford Survival Staff has an awful lot to offer. The basic set up is extremely versatile and with the available options you can really tailor the staff to you particular needs. To find out more call 870-732-2452 or visit crawfordknives.com.